Donald Trump is pushing back against a growing chorus of suggestions that he and his aides had improper contact with the Russian government during his presidential campaign, saying malicious leakers inside the U.S. Intelligence Community touched off the scandal by talking to reporters, The Daily Mail reports. ‘The real scandal here is that classified information is illegally given out by “intelligence” like candy. Very un-American!’ he tweeted. The president faces accusations that he was needlessly sympathetic to Moscow, along with renewed suspicions that his foreign policy was informed by threats of blackmail from Vladimir Putin‘s government. President Donald Trump, shown speaking with Russian President Vladimir Putin last month, attacked his own intelligence agencies on Wednesday, blaming malicious leakers for the scandal that toppled his national security advisor. Trump began his early morning tweet-storm with a swipe at cable TV hosts from the two networks he loves to hate. ‘The fake news media is going crazy with their conspiracy theories and blind hatred,’ he wrote. 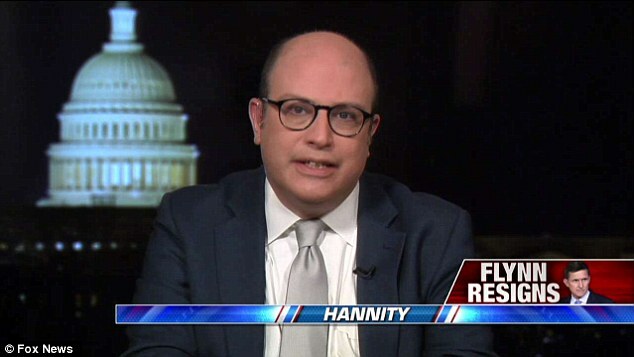 Trump singled out one Fox News Channel guest for praise – national security journalist Eli Lake. ‘Thank you to Eli Lake of The Bloomberg View – “The NSA & FBI…should not interfere in our politics…and is” Very serious situation for USA,’ he tweeted. Lake appeared Tuesday night on the Fox News ‘Hannity’ show. ‘Fox & Friends’ replayed a clip on Wednesday morning that included the quotes in Trump’s tweet. He argued that Trump is the victim of malicious leaks from inside the U.S. Intelligence Community, and suggested that partisan Obama administration holdovers are to blame. ‘This is the kind of thing that happens in banana republics, when the national police will go after a political leader that they don’t like, and using these extraordinary powers,’ Lake said. Trump may not have read Lake’s column that led Fox News to book him on the ‘Hannity’ program. 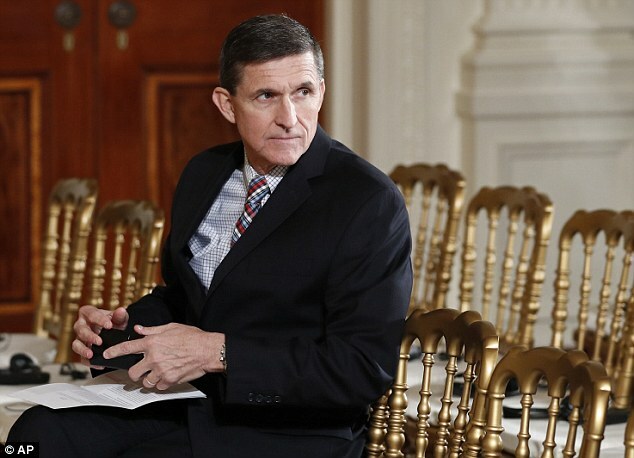 Lake wrote that he was skeptical of the White House’s official explanation for Flynn’s resignation – that he had lied to Vice President Mike Pence about conversations he had in December with Russia’s ambassador to the U.S.
‘[F]or a White House that has such a casual and opportunistic relationship with the truth, it’s strange that Flynn’s “lie” to Pence would get him fired. It doesn’t add up,’ he wrote.